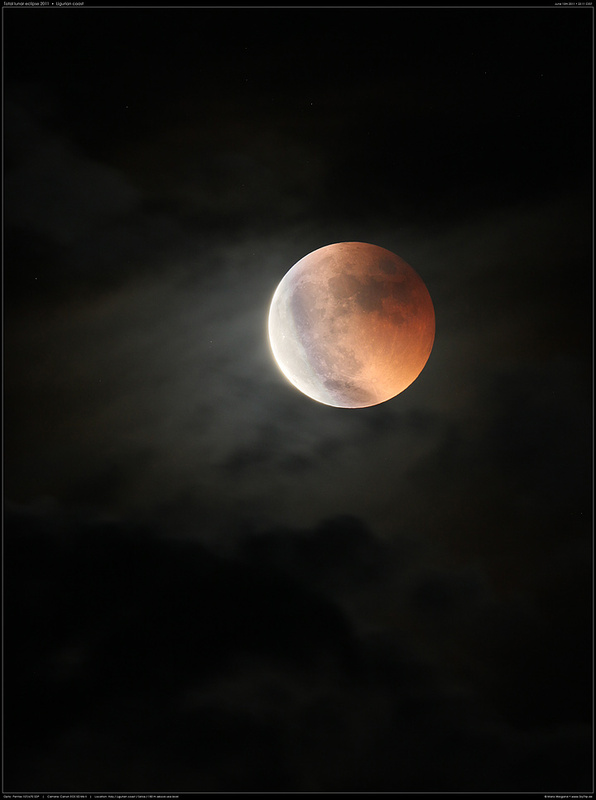 A lunar eclipse occurred on June 15, 2011. I'll be collecting images of it in this thread; if you have an image of it, you are welcome to post it here. (How to post images) Thanks! Last edited by Rare White Ape on Tue Aug 30, 2011 3:36 am, edited 2 times in total. Reason: Attached smaller image for faster downloading; left link to large image. Thanks for sharing and welcome to Asterisk! 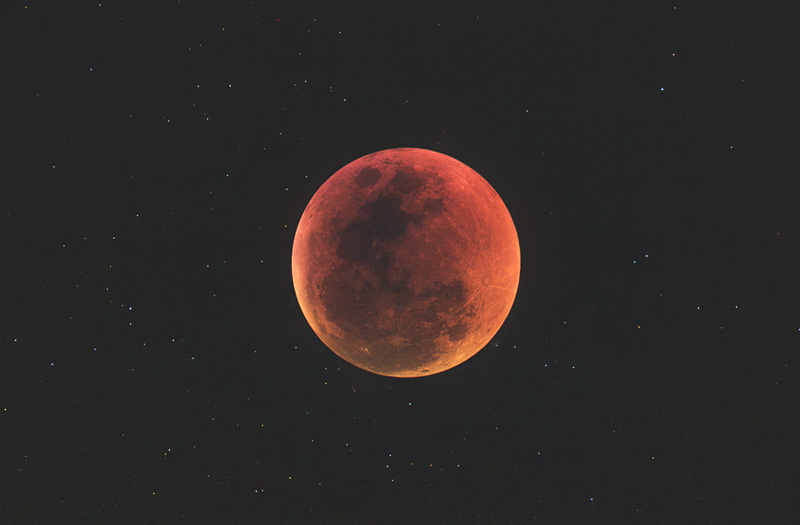 Panorama of total lunar eclipse and Milky Way. I was lucky to catch thies event where the weather was only open for half an hour or so at totality. 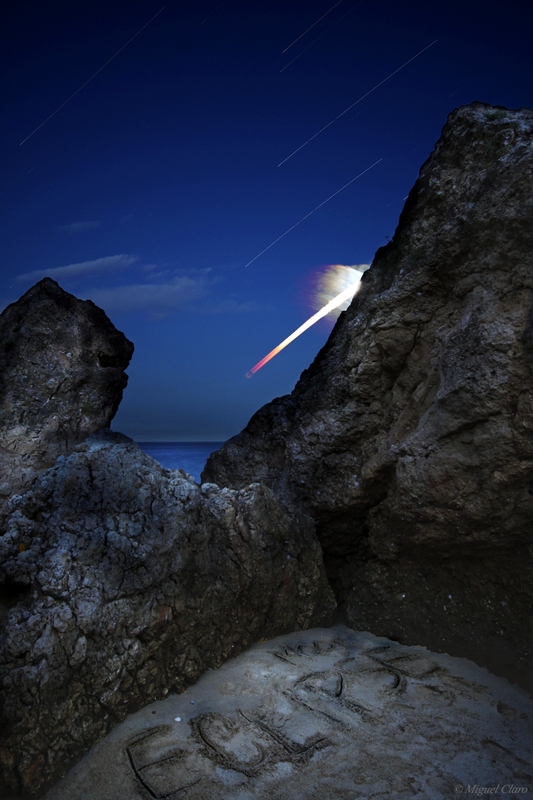 There is also a 0th magnitude shooting star at the right corner. Last edited by nuclearcat on Thu Jun 16, 2011 11:36 am, edited 4 times in total. 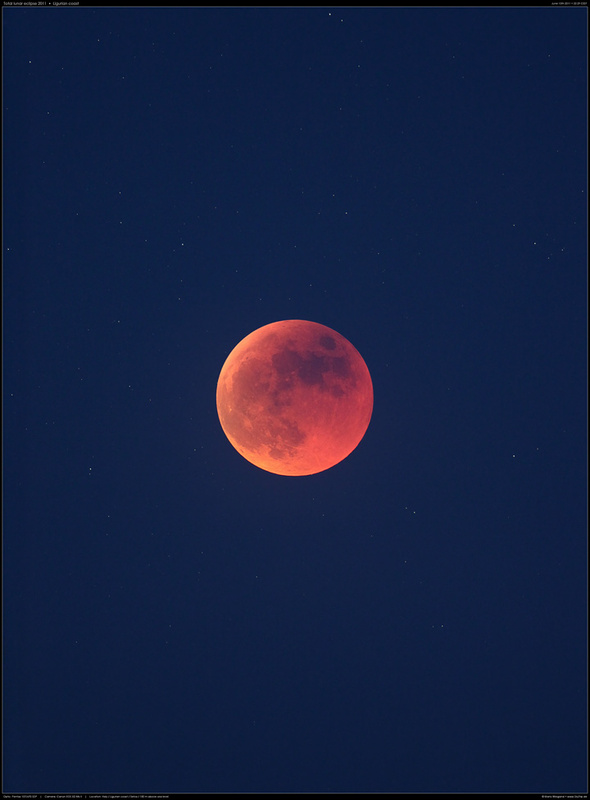 [attachment=7]claro.jpg[/attachment]In Portugal the moon eclipsed was born in the phase of totality, and only became visible in the hours of nautical twilight at 21h43 (local time). 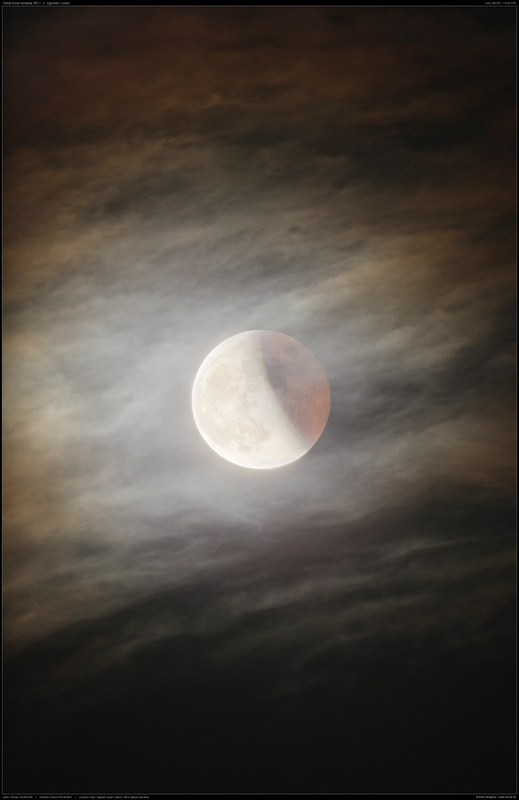 In the picture we can see the different tone of the track of the eclipse, while the Moon is moving out of the shadow cone of the Earth. 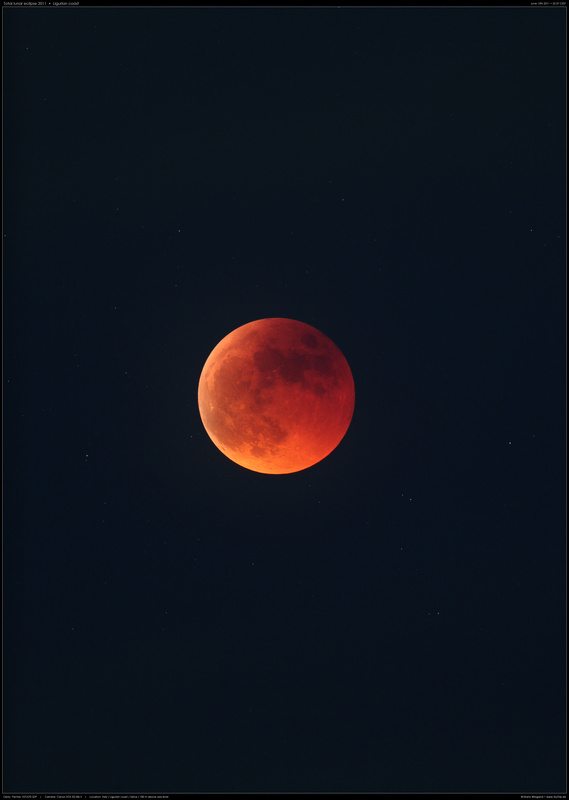 Early this morning I took a series of photographs of the Total Lunar Eclipse as seen from Parkes Observatory. The sky was beautifully clear with not a single cloud to be seen (and not a breath of wind). As I was driving to the dish, the Moon began to enter the umbra. It was a great sight. When I arrived at the telescope, I made my way to the adjacent field, which had recently been plowed. 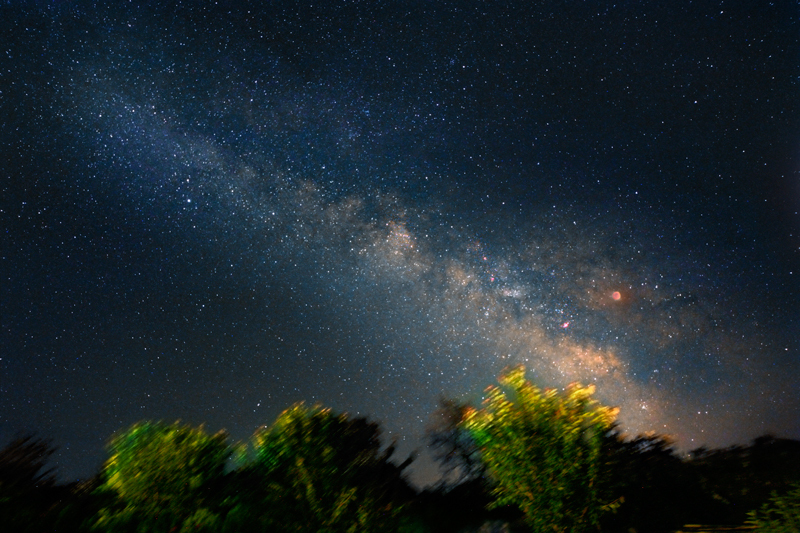 I was greeted with the glorious scene of the observatory dishes strewn out below the star clouds of the Milky Way. Scorpius was directly above The DISH with the deep red Moon to the right of it. Soon Scorpius began to set behind The DISH as the sky began to brighten with the twilight. I had positioned myself to capture the eclipsed Moon setting behind the Dish, but as the sky brightened, it became increasingly hard to see the Moon at all. About 25 minutes before it was due to set, I lost it altogether. 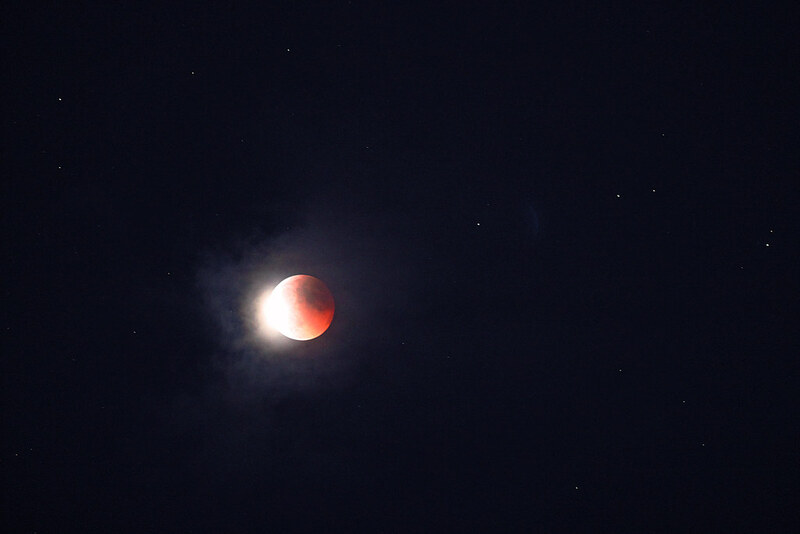 I missed the chance to capture the eclipsed Moon looming above the Dish. Because of cloudy weather in my hometown Bursa, Turkey, I decided to drive as far east as possible. I found clear skies in Göreme National Park, a UNESCO World Heritage Site. It took more than 8 hours to drive 650 km. GöremeEclipse shows the eclipsed Moon in the middle of the galactic bulge. 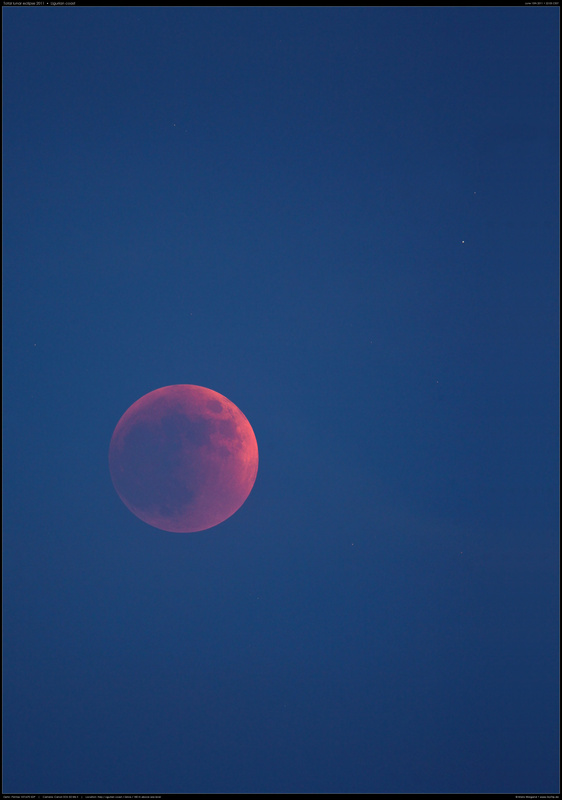 I took Le201106Max right at mid-eclipse 2012 UT, with a 8" SCT. This was really dark eclipse. 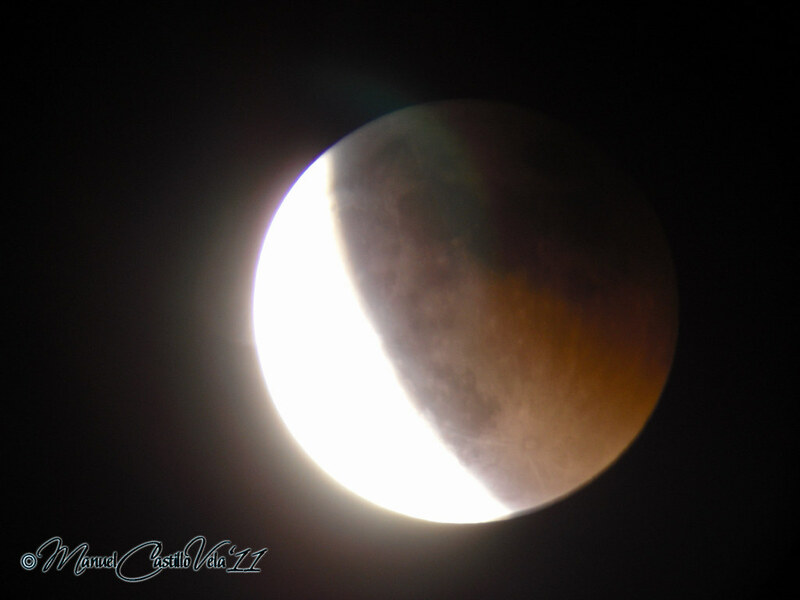 So dark that I needed 3200-ISO 15-second exposures at mid-eclipse. I guess the central Danjon was smaller than 1, the edges 2 to 2.5. 201106EclM8-20-21 shows the Moon, Lagoon-Trifid-M21 group and everything in between, 8 minutes before mid-eclipse. Capturing his scene was much easier than I would imagine, as the eclipse was very dark. I did shoot 5 separate exposures, but the data from shorter exposures contribute little to this HDR portrait. 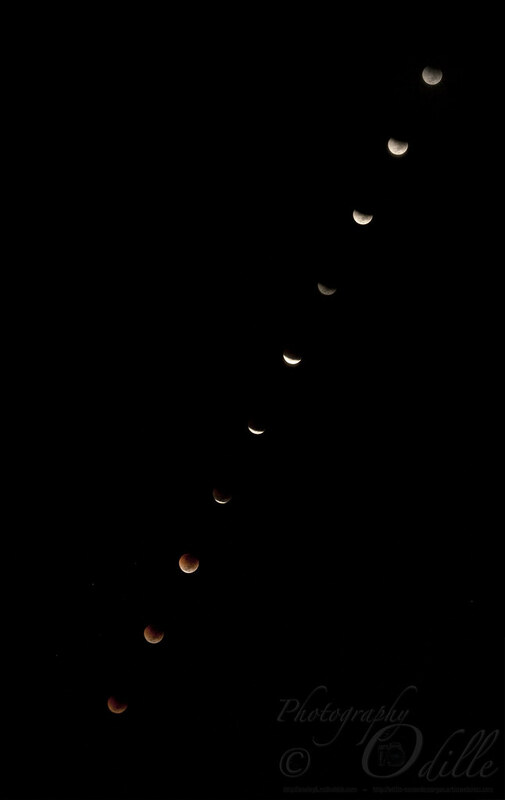 Lunar Eclipse montage from terranora, far north coast NSW. Hasselblad H2/P20/HC50-110 @ 110/f8, images at 10 min intervals from 0422AEDT. Some thin clouds accounts for the faintness of some of the partial stages. Oh what a night!! A total lunar eclipse and clear skies, I couldn’t have wish for more. From Donegal, Ireland, Moon rise occurred just after totality but I was still able to capture everything that was visible from my location. I searched google maps and street view for the past few weeks trying to find the best location in the county to view the eclipse from. The pier in Mountcharles, outside Donegal town provided a picturesque setting and a clear a south eastern horizon making it my location of choice. The weather forecast was predicating a relatively good chance of clears skies. So I packed the car up and headed off brimming with excitement. Upon arrival I was thrilled with my choice of location but the skies were looking threatening, clouds everywhere….. expect the south east and that’s the way it stayed all night. The weather was making up for the bitter disappoint of missing December eclipse because of cloud. A few curious passer-byes rolled up to have a looked. The excitement was building and then around 22:10..Euricka!! There she was. 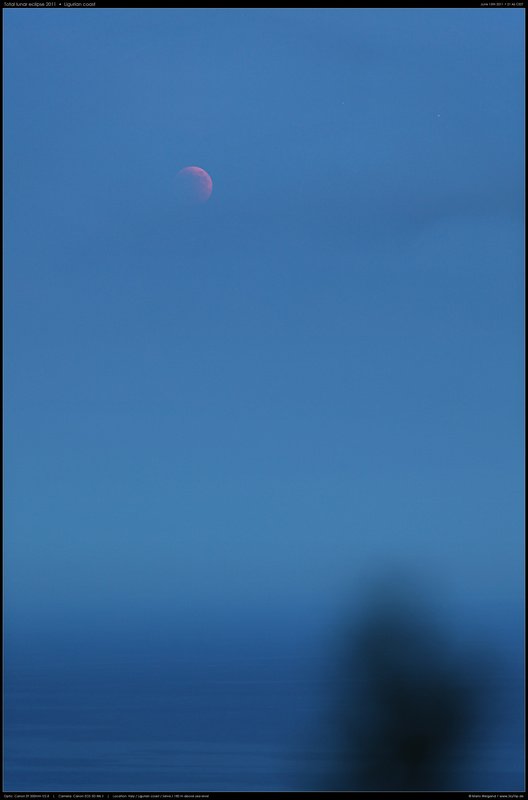 The dim, red, eclipsed Moon just hanging over the horizon. 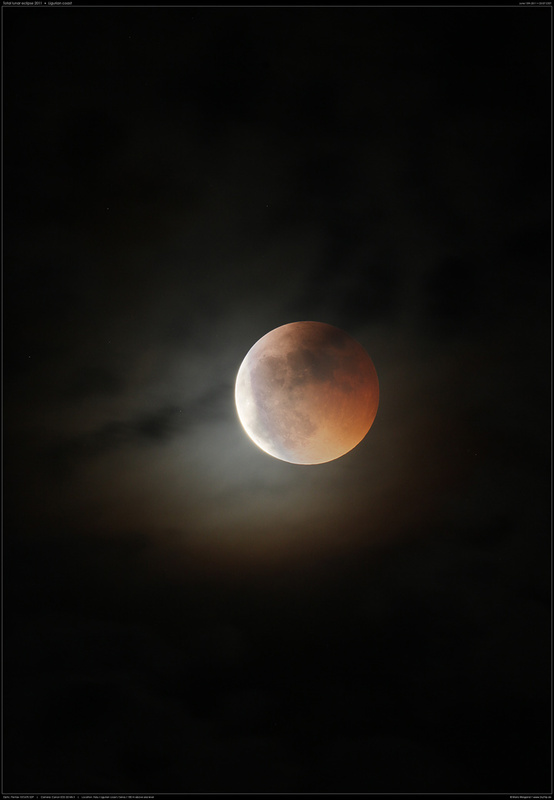 A magical and humbling hour followed as the Moon climbed and grow back in to its original form. 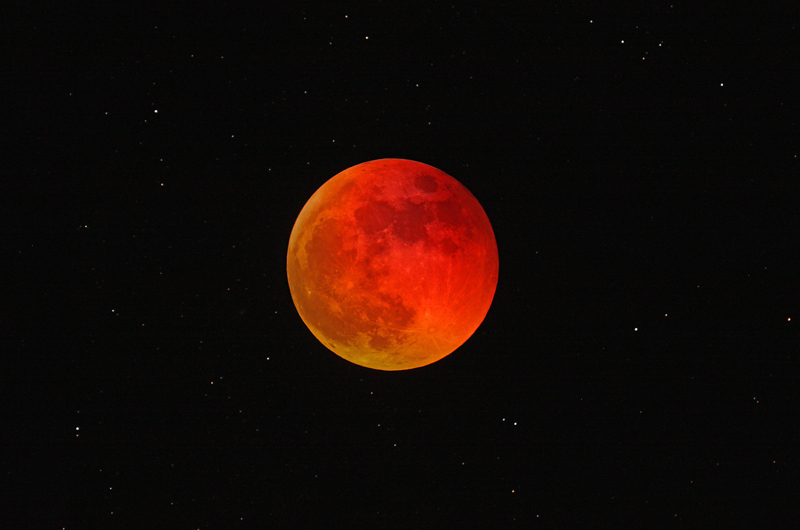 An amazing night of astronomy. Easily the most memorable experience I have had during my short time in astronomy, along with March’s aurora display. Lightning eclipse from the planet of the goats! 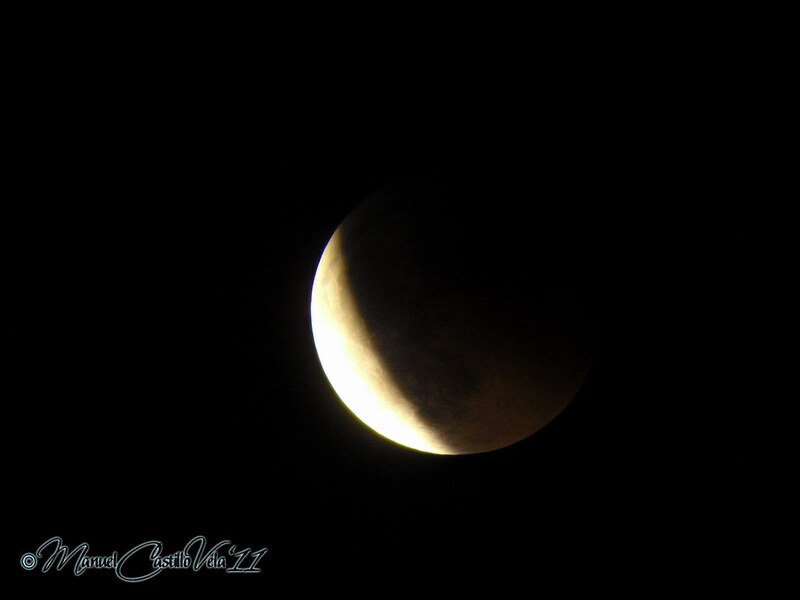 Here is our first image of the eclipse from Granada, Spain. It features the Alhambra, the Sierra Nevada mountains and. 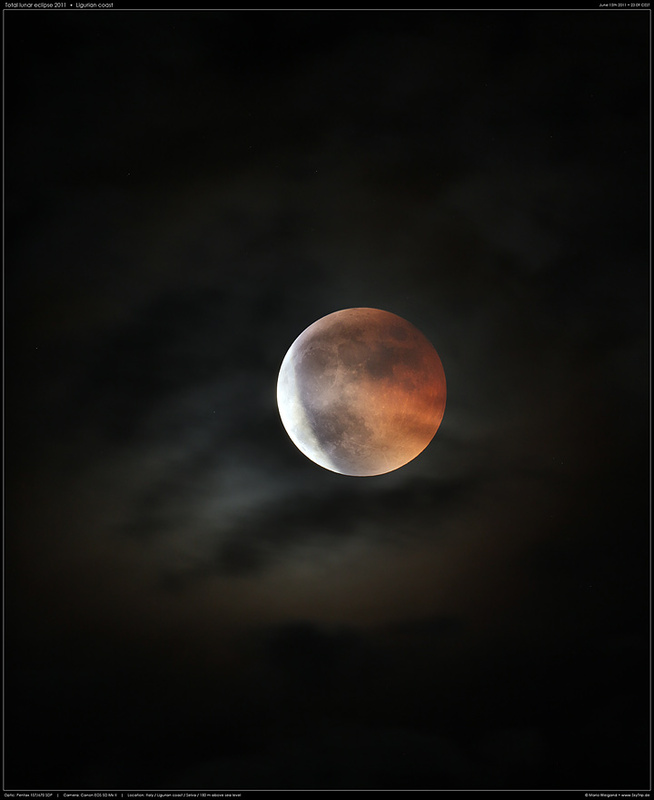 of course, the eclipsed moon. These are all wonderful images - excellent work, everybody! here are some pictures of the eclipse from Italy (Ligurian coast).